Top-of-the line personal defense 38 Special +P+ ammunition in stock! 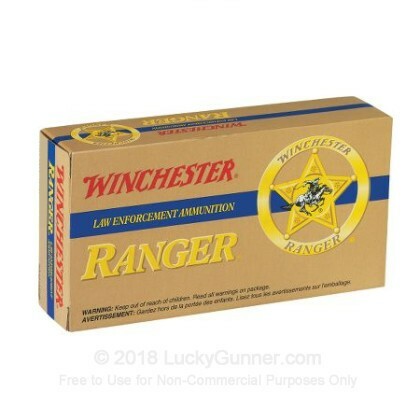 The Winchester Ranger line of ammunition is engineered for increased velocities and stopping power and is some of the most powerful 38 Special rounds produced today. Winchester welded the casing and bullet together for the Ranger products, which allows them to work in unison for more controlled expansion and retention of weight at impact. Manufactured by the legendary Winchester Ammunition Company, this product is brand new, boxer-primed, nickel-plated brass cased, non-corrosive, and re-loadable. Ballistic gelatin testing is one of the best methods we have available today for predicting the real-world performance of self-defense ammunition. 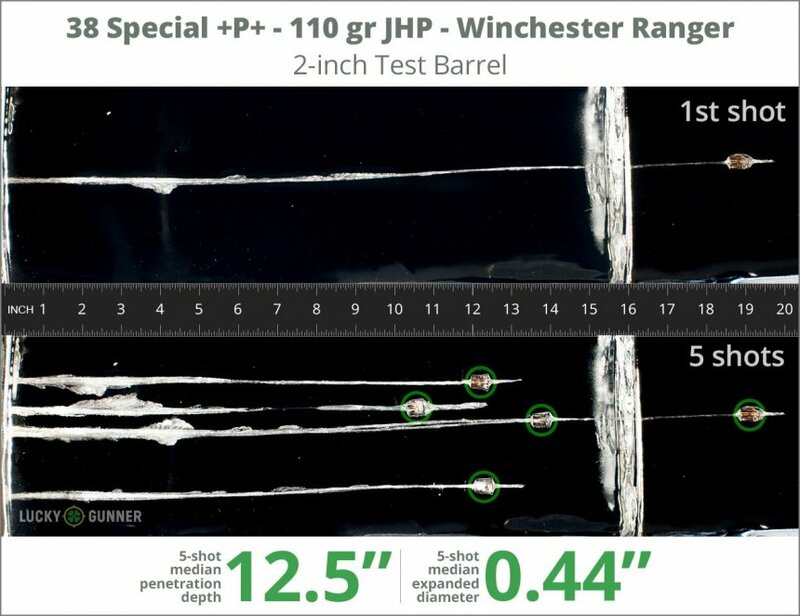 We’ve used Clear Ballistics synthetic gelatin to test over 150 handgun loads, including Winchester 110 Grain. We fired 5 rounds into the gel with a four-layer cloth barrier to determine whether heavy clothing would affect the penetration and expansion characteristics of the bullet. All rounds were fired from a Kimber K6s to reflect the type of short barreled compact pistols that are most commonly carried by legally armed citizens. Above, you can find photos of the actual bullets suspended in the test medium. Images of the recovered bullets are below on the left and high-speed footage of the first bullet fired into the gel is below on the right. 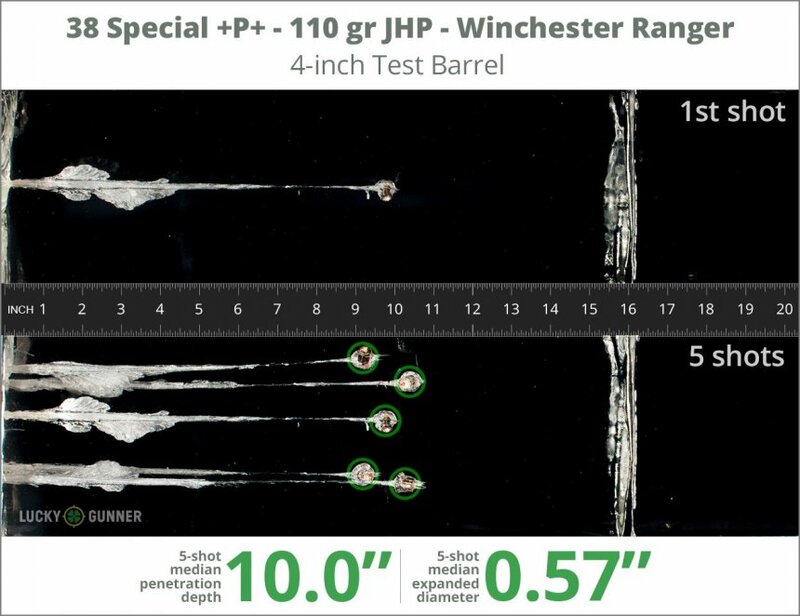 All of the data we collected from our test of Winchester 110 Grain is in the chart below that along with diagrams that might give you an idea of how this load compares to other .38 Special products. How do the results for this Winchester .38 Special compare to other 38 Special Ammo? 12.5" 0" 9.5" 14.7" 30.3" This ammo: 12.5" Min: 9.5" Median: 14.7" Max: 30.3"
Ballistic gelatin testing is one of the best methods we have available today for predicting the real-world performance of self-defense ammunition. We’ve used Clear Ballistics synthetic gelatin to test over 150 handgun loads, including Winchester 110 Grain. We fired 5 rounds into the gel with a four-layer cloth barrier to determine whether heavy clothing would affect the penetration and expansion characteristics of the bullet. All rounds were fired from a Ruger GP100 to reflect the type of short barreled compact pistols that are most commonly carried by legally armed citizens. .75" This ammo: 0.57" Min: 0.35" Median: 0.45" Max: .75"
10" 0" 9.5" 14.7" 30.3" This ammo: 10" Min: 9.5" Median: 14.7" Max: 30.3"